And finally, we come to acceptance. Yes, it’s true. 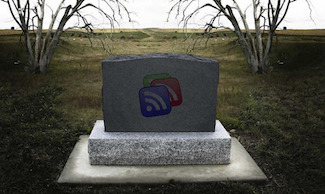 Google Reader really is going away on July 1. So if you haven’t rustled up an alternative yet, it’s time. If you’re a Google Reader user, obviously you need a new tool to read your subscriptions. We have a few thoughts for you on that. But if you’re a content publisher, you’ll also need to make sure that your audience has a way to continue tuning in for everything you do. Feel free to point your audience to this post, or you may want to craft a message of your own with more individualized suggestions for your audience’s needs. But be sure you send out a clear, specific call to action and keep those subscribers on board — no one wants to lose a big chunk of their audience just because a tool goes away. If you’re sticking with RSS, you’ll need to pick your new reader of choice. Feedly is seeing a lot of takers, and they have a handy one-click Google Reader import. They also have more detailed migration instructions here: Tips for Google reader users migrating to feedly. If for some reason feedly doesn’t ring your chimes, Marketing Land has published a useful list of other options: 12 Google Reader Alternatives. RSS is a great technology — but it doesn’t work well for everyone. Some readers just never embraced the day-to-day workflow of reading in an RSS reader. And some of those folks are almost certainly in your audience. One communication technology that works brilliantly for a lot of readers is email. It’s familiar and it’s already integrated into their daily habits. Email subscribers also tend to be just plain more responsive than those who read you in an RSS reader. They read more, interact more, and — if your content is supporting a business — they buy more. If you’re a content publisher but you personally can’t stand email — get over it. Email works. You may love RSS (lots of web writers do), but a good chunk of your readers don’t. So if it isn’t already, get your feed set up to deliver via email (I happen to like Aweber for this, and it’s what we use on Copyblogger) and give your subscribers the option of choosing what works best for them … whether it’s your personal preference or not. If you’re a Copyblogger reader and you want to get our blog posts by email, we make that easy for you. Drop your email address in the handy box and we’ll get you set up. I never offered my readers an RSS option. It’s there if they know how to get to it, but I never publicized it. Feedly is good but not nearly as good as Google Reader. Come to find out Reader may be one of Google’s best products I don’t know why they wouldn’t just incorporate the RSS reader feature into GMAIL. I found a way to add Google reader to google plus. It doesn’t really work that well though. I never used Google reader, but was an early user of Feedly. Feedly works fine for me. I guess I don’t understand why there’s been so much fallout. Thank you for the reminder of another way to be proactive and serve our customers! “…give your subscribers the option of choosing what works best for them … whether it’s your personal preference or not.” Standing ovation for that one Sonia. Timely and practical post – thank you. George – I agree with you. There are a lot of RSS to email service providers – I like FeedBlitz and I know Copyblogger uses them too. They allow readers to get articles in a range of ways from email to direct Tweets – Reader Chooses. If you do have a REader account, you can download all the feeds you subscribe to into XML (it’s Google Takeout). I won’t resubscribe to everything – but I’m trying Taptu as my reader for now along with Reeder on the iPhone app. What’s not clear is whether when the GReader dies, will the feed subscriptions inside these new apps? They were imported and it’s not clear that the subscription is now sourced inside the new app and not drawing the feed from Reader. We actually use Aweber for our RSS-to-email. They’re a very solid, business-friendly service and we find they work very well for what we do. I have found clickthrough and conversion rates always very low with RSS. When I send the same content by email, well, there’s no comparison. So I’m thinking of removing my RSS links. Does anyone have different experience with RSS? If so, what do you think it is that makes your click and conversion rates good? I would advise against getting rid of your RSS subscription for one reason — many of the influencers who will link to you and/or share your comment on social sites are RSS readers. Those are the people who will help grow your audience, so you want to make sure their needs are met. I’ve never seen a case where clickthrough or conversion were better on RSS. There are always exceptions on the web, but better than 99% of the time, email will convert better. I think that the best advise in the article is giving your subscribers the option of choosing, don’t give up on RSS entirely. I personally know some content junkies who prefer it. They might be few, but as Sonia said, they might be exactly the ones who’ll bring you more exposure. My experience with RSS is pretty much the same. I’d actually love to see if there are any exceptions who get better conversion with RSS – could be a great case study. Sonia, are you familiar with any examples? I would never encourage my audience to go with feedly over email for the reason I just mentioned to Johnn above — conversion, responsiveness, and clickthrough are vastly, vastly better from email. What I recommend is that you make both available, you (gently) encourage email, but that in the end, you’re here to serve the needs of your audience, so you deliver content in the format(s) that they prefer. A-freaking-men! I don’t bother with RSS because as a reader I don’t bother with RSS. Only two people in my life even know what RSS is. Starting a slow clap on that one. To prepare for the death of Google Reader, I searched though all the apps on the the Mac App store. None of the ones I found were as good as Google Reader (I suppose I was used to it) but I settled for Newsbar which also has a separate app for my iPad and iPhone. They all sync nicely together. Can’t stand Feedly – find the interface a pretentious over-design at the expense of convenience. I’m using The Old Reader and am happy with it. Closest alternative to Google Reader I’ve found. Thanks for the info! Good to know about options. This was a blessing in disguise – I’ve been using Feedly for a month and find it way better than Reader. I have always like RSS feeds better anyway. If you have an audience that is engaged in your blog and enjoys getting your articles, they like getting the updates via RSS. And as for email subscription, it’s just common sense. This. I have a lifestyle blog rather than a true niche blog, so I have to straddle the worlds of the heavy readers like myself who like the magazine like format of RSS (and except for a buggy problem with items not being marked as read on scroll, I LOVE Feedly) — but I am also getting my feet wet and making the transition from hobby blogger of many years to professional blogger, and am starting to build my email list. We need to go where our readers are, not just where we are comfortable. I detest reading blogs via email, but I know a lot of people love it. I also know that a lot of people now get most of their blog reads through social shares on Facebook and Twitter and Pinterest. Neglecting those sites is another mistake. Another great option is http://bloganizer.com They also let you post your blog so others can find you there. I have always used a subscribe by email of some sort and it does seem to be more popular with the less tech-y crowd than RSS is. That being said, I love to have just one application to grab all the latest posts from my favorite blogs, etc. I was using feed demon, but it looks like I will loose that come July 1. Off to try Feedly….if that doesn’t suit, I have the handy link you gave bookmarked as back up. Thanks for a usable post, as always! Good luck finding the right tool, Jennifer! One downside of free tools, they go away just when we get to really depend on them. There is a third option, WordPress Reader. Thanks to the WordPress.com Extension for Chrome (and other browsers, I think) you can follow virtually any blog or website. Updates are delivered to your WordPress Reader feature and/or to your email. The catch is you need a WordPress.com username (but not necessarily a WordPress.com blog) or a Gravatar profile. If you haven’t tried the WordPress.com Reader in a while, I highly reccomend it, many changes and importments have been made resulting in what has become my go to Reader for following and interacting with other blogs and bloggers. Feedly is a great option, but I hadn’t thought of subscribing by email. I am currently in the process of developing my own “content creation system” and one of my top priorities is to become more effective at managing the “flow” of information that I receive. Your post has made it easier for me. I can now remove Google Reader as an option. I was never a big fan of Google Reader. Thank you for listing the potential alternatives. I’m pointing current RSS subscribers to Bloglovin’ and also setting up a daily email subscribe option via my Mailchimp account (currently I only email out weekly). Personally, I follow blogs via RSS and will continue to use the Feeddler Pro app on my iPad and iPhone as they will carry the feed over as normal. I’m enjoying Tiny Tiny RSS on my own server account. Looks just Google Reader and imported my GR subscriptions. I’ve been using Feedly and it seems to fill most of my needs that Google reader used to. I actually prefer it for my own reading over email newsletters as I can scan large amounts in a short period of time. Of course when I’m the publisher I much prefer to get readers on my list. Isn’t this a little late for the event? Google Reader has long been buried. But then again, some people hold on to their griefs longer than some. So I guess there are still people out there who’s going to need this article’s advice. I have to say, the tips are great! i say I would go for number 2 option. This statement- It’s familiar and it’s already integrated into their daily habits- had me, Sonia. Feedly looks like a winner for me!!! I will miss GReader though. Twitter can be a great news reader and if you’re a publisher make sure you’re not missing out on that opportunity for your readers too! Feedly works for me although I wish they’s scale down on all the design bells and whistles. Simple and clean works. I’m still in the anger stage, but I’ve been trying out alternatives. I haven’t found one that I’m completely happy with but feedly works the best so far. Thanks for your contribution, but I had a difficult time following this “technical” flow of ideas. I am not the most tech-savvy guy in the world. I like to stay updated, so I subscribed to relevant and appropriate blogs and newsletters. It seems like I am always searching for such material/literature. I plug in my email ID# and I am subscribed and this has worked well for me. I am sure this system is streamlined and it has helped a lot of readers who want to be subscribers. Other than that, I have a lot to learn and a long way to go before I figure out how things work on the internet. Have a good one. anyone using smashing reader? i made the switch to smashing reader over feedly. I moved my personal feed subscriptions to Feedly quite some time ago and am really happy with Feedly. As for my readers, I’m offering a number of alternatives, including Feedly, Bloglovin and email. I prefer subscribing by email but Feedly seems a good alternative. Great post. I currently have a lot of my followers on Google Reader, so I’m thinking of sending out an email telling everyone how to make the switch. I choose to switch to email, when you use email you can get weekly digests of the blog posts which makes them easier to manage. I’ve found that email allows me to see blogs that I don’t really want to read every single post so I can unsubscribe from them and follow on Twitter instead. Saved me so much more time from not using an rss reader. I use Google reader everyday and a big fan of it. Its death is a sad thing to me, however now I am using Feedly! Not really easy to navigate like Google reader.